This lovely, light filled, lushly landscaped 1,800 sq. ft. 2-story condo in the heart of Scottsdale will be your 'Home Away from Home'. Bright and spacious, with soaring 20-foot ceilings and floor-to-ceiling windows in the living room. Tile floors in the living areas. 3 large bedrooms, each with its own bathroom and lots of closet space. Huge, spotless, fully equipped kitchen with separate laundry room. Separate dining area seats 6. Wireless high speed Internet access. Flat screen digital cable TV with hundreds of channels, including HBO, Showtime, Cinemax and Netflix! The sparkling pool is a few steps from your front door! Secluded and recently renovated, this picturesque property is unique and very special. Privately owned and cared for by the owners, Paul and Rosemary. We live next door and are available 24-7 to make sure that your stay is comfortable and worry free! Private gated entrance, private front and back patios, and "Juliette Balcony" off the master suite overlooking the pool. Off-street parking. This lovely secluded property is in a quiet residential neighborhood, just a short walk along the canal to the heart of lively, sophisticated downtown Scottsdale. This lovely 2-story condominium is truly an 'Oasis in the Desert'. In our effort to be as environmentally conscious as possible, we provide environmentally friendly detergents and soaps, and use CFC light bulbs wherever possible, plus, we provide a recycling bin. Mission Statement: Our mission is to do our best to ensure that you have a worry free stay. If there is ever a problem, we are close by to fix it. If there is any way we can make your stay more enjoyable, we are here to help with recommendations, advice or directions. We have lived in the Valley of the Sun for over 30 years. The reviews you see on this site are from a few years ago. The reason for this is that we rented the property full time for several years, then when we re-listed it, thought we would try AirBnB and Trip Advisor for a change. Now we are on all three! We have lived in Arizona for over 30 years.Paul is very well known in the community, having been the 'Director of Romance' and Maitre d' for 10 years at the world renowned T. Cook's restaurant at the Royal Palms Resort and Spa in Phoenix, and also Maitre d' at Prado at the InterContinental Hotel Montelucia Resort and Spa in Paradise Valley, so we are well versed in the art of Hospitality. As the proprietors of another vacation rental business, Villa Rosa Rentals for several years, we have developed a reputation for always making our guests feel welcome and at home. Sparkling, spacious bathroom #1 off master bedroom is newly renovated. It features two sinks with granite tile counter-tops, huge block-glass walk in shower and tons of storage space. Toilet is in a separate room, for privacy. Bathroom #2 off 2nd bedroom upstairs has granite tile counter-tops, single sink, toilet, storage space and shower/tub combination. Bathroom #3 off 3rd bedroom downstairs has granite tile counter-tops with single sink, toilet & shower. We provide environmentally friendly soap for your convenience (such as Method) Plenty of large, fluffy, absorbent 100% cotton towels included. The condo is located just a short walk along the canal into downtown Scottsdale, with all its cafes, restaurants, galleries, bars, and of course, Fashion Square Mall. We are surrounded by mountain preserves with some fabulous hiking trails! Camelback Mountain (5 minutes) Phoenix Mountain Preserve (15-20 minutes), Pinnacle Peak and McDowell Mountains are just a few! Old Town Scottsdale has wonderful shopping, Mexican import and Native American shops, Civic Center with lovely gardens, Scottsdale Library, SMOCA, Center for Performing Arts, Museums, bars & cafes. Scottsdale Waterfront (10 minute walk) features Soleri Bridge, the Canal Bridge, trolleys, boutique shops and picturesque restaurants. Chaparral Lake is a 5 minute drive, situated in the center of Chaparral Park. The Park features a new playground, baseball and soccer fields, tennis courts, volley ball courts, walking paths, etc. Spiral staircase to 2 bedrooms upstairs. Detergents (laundry & kitchen) are provided and are all environmentally friendly brands, such as Seventh Generation, Method, etc., as well as environmentally friendly hand soaps. Tile floors in living areas downstairs, carpeted staircase and upstairs bedrooms Pool towels provided. Side-by-side full size refrigerator/freezer. Ground coffee provided, along with automatic drip coffee-maker, French press & coffee grinder All utensils, pots & pans provided. Granite tile counter-tops in kitchen. Built-in microwave. Gas stove. Huge, completely renovated kitchen with skylight. One off-street parking space + plenty of on-street parking. Convenient, full size washer/dryer in separate laundry room off the kitchen. Completely separate and private gated entry, with gorgeous hand-made wrought iron gate Baby's playpen (Pak 'n Play) available. Condo was very clean and comfortable. Paul and Rosemary graciously welcomed us upon our arrival and provided all the information we needed for an enjoyable stay. The kitchen was fully stocked and contained conveniences for travelers; tea, coffee, spices, etc... Great location - we walked just about everywhere we wanted to go, Restaurants, Bars, Old Town and more. I highly recommend renting with Paul and Rosemary. 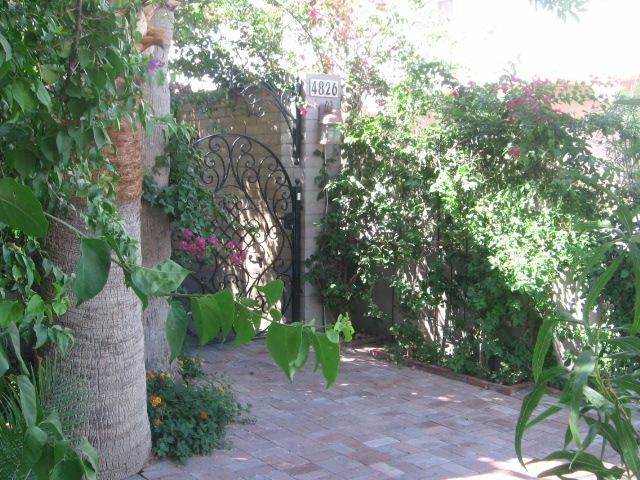 A large, beautiful house located on a quiet street just a short walk to downtown Scottsdale. Flowers all around this lovely 3 bedroom, 3 bath home. Floor to ceiling windows in the living and dining rooms. Great kitchen, fully stocked with lots of dishes, silverware, glasses, etc. Lots of towels and linens, too. The artwork is beautiful and enhances the beauty of the house. Lots of outdoor seating and a pool (shared with just a few others). A very short walk to the canal and only a 10 minute walk to downtown waterfront. The hosts, Paul and Rosemary, are charming, acommodating, considerate and helpful. Very highly recommend this wonderful home. Great Location, Great Hospitality, Very comfortable Condo for our entire family. Hopefully we can stay here again our next visit to Scottsdale! Walking distance to Fashion Square and many restaurants. Condo was spotless, beds were very comfortable, also the outdoor seating areas were outstanding! Susan and Mark were fantastic guests. We would welcome them back anytime. And we thank you for the great review! Great place. Paul and Rosemary are wonderful hosts. Our family thoroughly enjoyed staying at this property. It is a beautiful place with lots of room and amenities. It is so close to everything, in a very quiet neighborhood, and the outside landscaping reminded us of an Italian villa. Everything we needed was here and the owners were always available if we had questions. Paul and Rosemary are wonderfully warm and so easy to work with. They went above and beyond to make sure our needs were met. Totally loved staying here! Thank you for the great review! We LOVED meeting you both, as well as your wonderful family. So glad you enjoyed your stay, and we would love to welcome you back again anytime. Wonderful condo, beautifully landscaped and with great hosts. We very much enjoyed our stay at Desert Rose. Great 3BR condo with nice small pool. Very quiet. The condo had everything we could have wanted and more. Very clean and for us, a great location. Close to restaurants and food stores. Easy parking if you have a car. The hosts could not have been more helpful. We will return. Our beautiful villa is located in a quiet residential neighborhood, yet just a short walk to downtown Scottsdale with some of the finest restaurants, bars, shopping areas, museums, golf courses & parks in the Valley of the Sun. Closest major cross streets are Scottsdale & Camelback. Close to Fashion Square mall, Scottsdale Waterfront & Soleri Plaza/Bridge. Green belt biking from N. Scottsdale to Tempe. Many beautiful golf courses close by. Movie theaters, Old Town shopping & Art Galleries. Spectacular Camelback Mtn., Phoenix Mtn. Preserve, Desert Botanical Gardens and McDowell Mountain Preserve. Less than a 1/2 hour drive: Tempe Town Lake and Downtown Phoenix (Diamondbacks & Phx. Suns). Golf: Golf courses abound in and around Scottsdale.